If you are planning to do this walk as a round trip (approx. five miles each way, ten in total), my preference would be to start at Cayton Bay. Plenty of free car parking and the views are better on the way back. 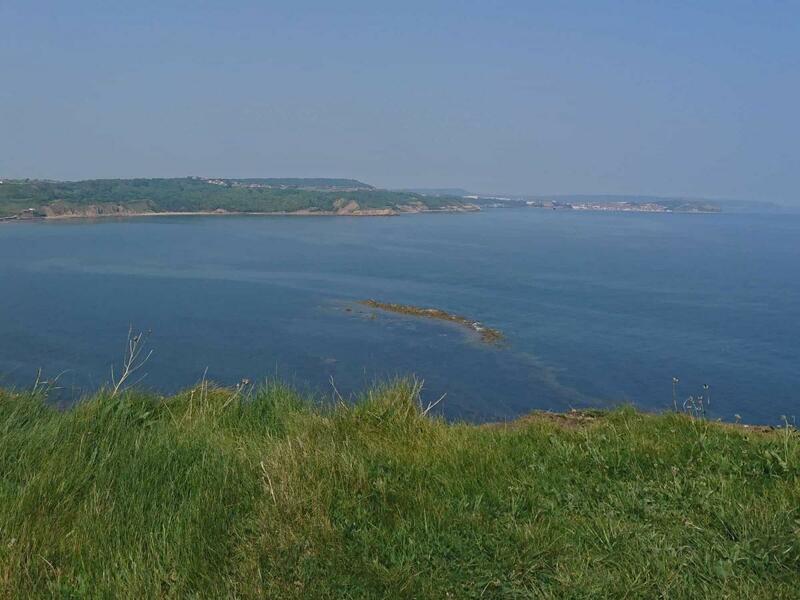 However, there is plenty of car parking on Filey Brigg (Country Park) if you want to start there. Car parking in the Country Park is quite expensive during the summer months, but free in the winter. If the round trip is too long, Filey and Cayton Bay are both on the EYMS No. 13 bus route. This runs every 30 minutes or so during the summer. At Cayton Bay there is plenty of free parking available on the remains of the old A165 road at the top of the cliff. Once parked walk along the road to the track which runs past the pay and display car park and surf shop. 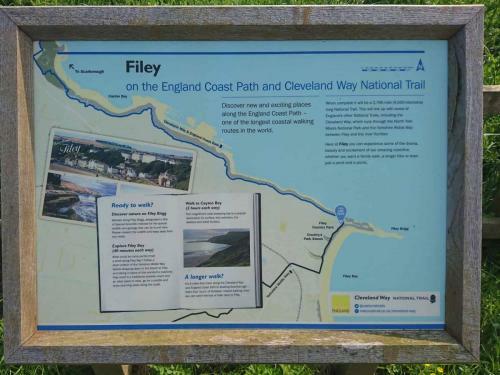 Once you have walked past the car park look for the wooden Cleveland Way sign which reads “Filey 5 miles”. 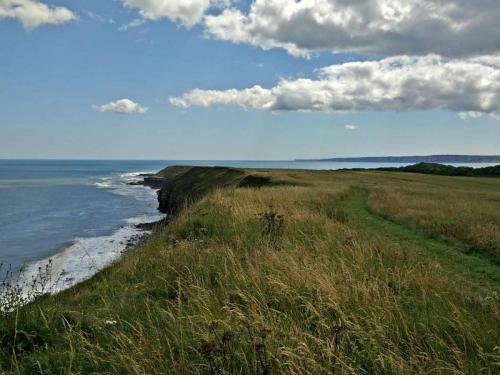 The cliff top path to the right is obvious, and easily followed all the way to Filey Brigg. For much of the route the path runs very close to the edge of the cliffs. So make sure your dog is on a lead. 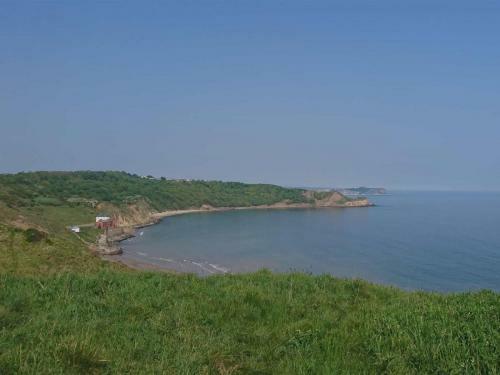 Lebberston Cliff and Gristhorpe Cliff. Starting the walk it’s a moderate climb past a few houses. 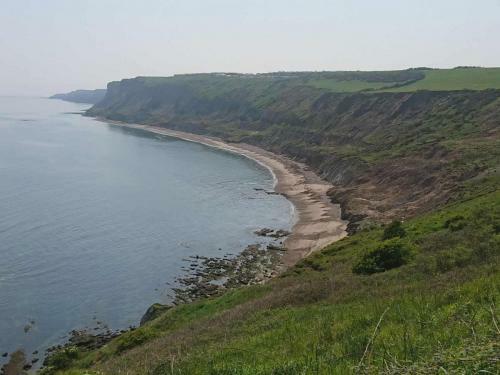 Then up to the headland at the southern end of Cayton Bay – Lebberston Cliff. Note the path here is not fenced on the seaward side, and is quite close to the edge and some steep drops. 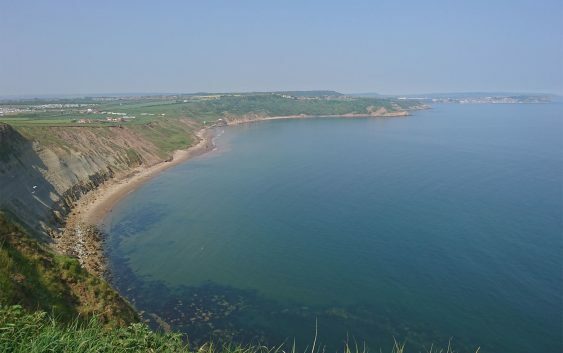 There are stunning views from here down back to Cayton Bay, and beyond to Scarborough. Rounding the headland the path descends slightly before rising again to Gristhorpe Cliff and passing the Blue Dolphin Caravan site. Obviously, this was built close to cliff edge so that guests staying at the site could enjoy the splendid sea views, but it does “intrude” on the walk a little bit. Fortunately you’re soon past the site and back to open countryside. Gristhorpe Sands – I have never seen anybody down on the beach here. 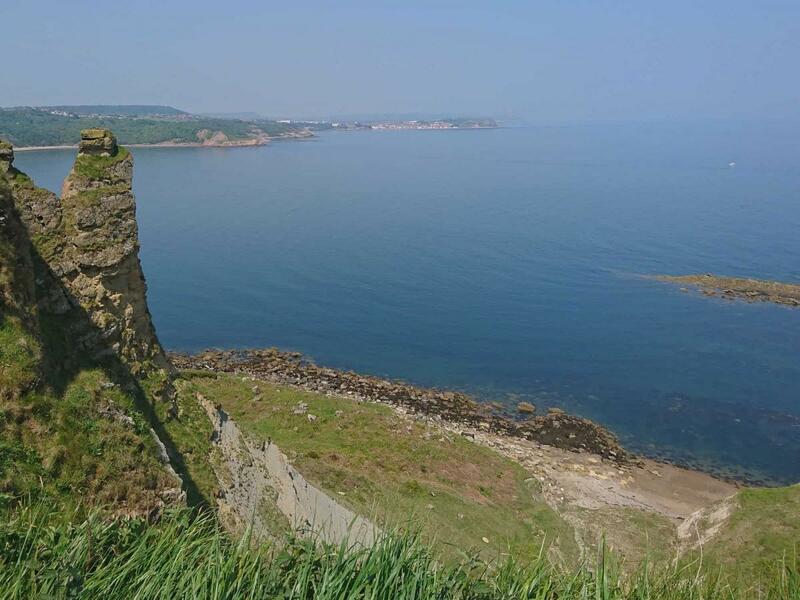 Apparently it is possible to descend to sea level at Castle Rocks and Yons Nab just past Lebberston Cliff. I have never tried this – there doesn’t seem to be an obvious path or route down. 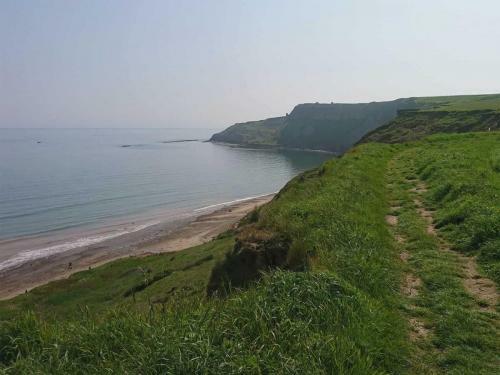 Certainly there is no route down to the beach below the Blue Dolphin, as Gristhorpe Cliff is quite steep and perilous. 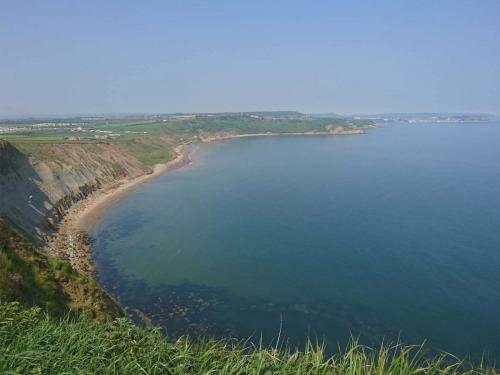 Maybe you can walk around the foot of Lebberston Cliff at low tide from Cayton Bay – too rocky to do with a dog though I suspect. If you do know of a route down to the beach, perhaps you’d be good enough to leave a comment. Leaving the Caravan site behind, the path follows the cliff top around to the right and the imposing faces of Newbiggin Cliff and North Cliff come into view. 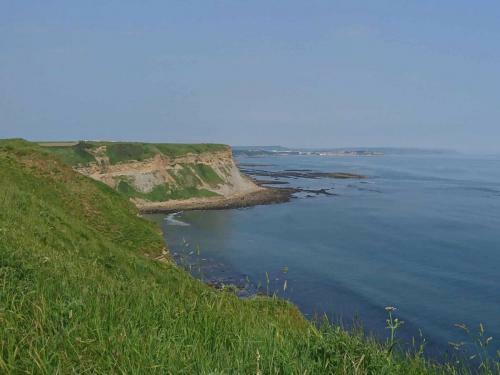 These stretch all the way to Filey Brigg, still a couple of miles away. It is then an easy walk along the cliff top path to Filey Brigg where there is a stone monument indicating the start / end of the Cleveland Way. The Wolds Way starts at the same point. Before returning to Cayton Bay a walk along Filey Brigg is well worth the effort. 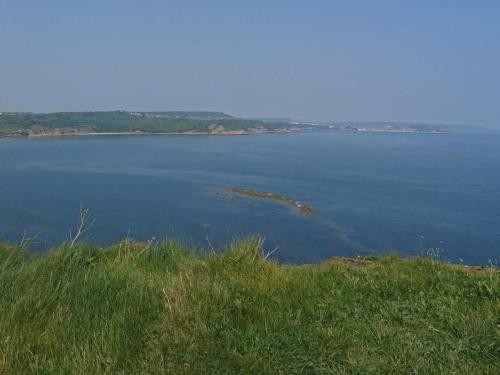 Filey Brigg is a long, narrow peninsula with steep cliffs. 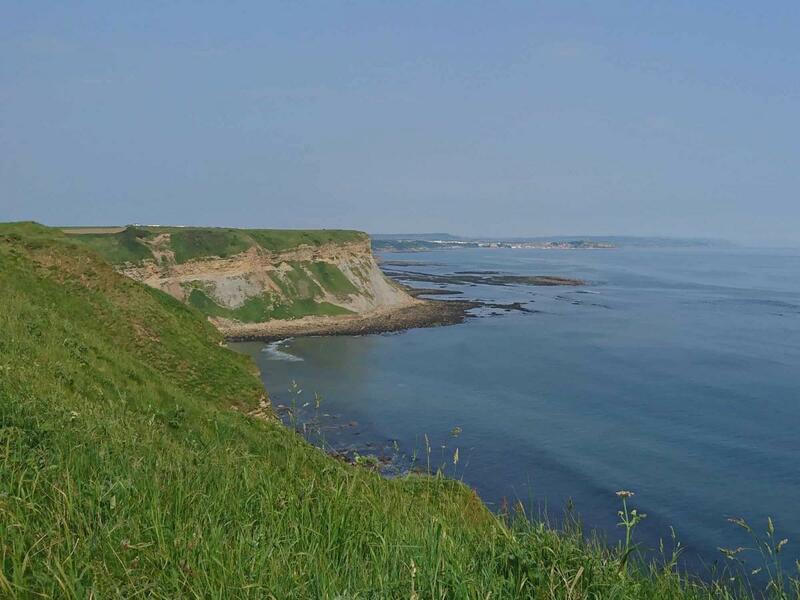 About half way along the top of the Brigg look out for a path on the right hand side which descends to Old Quay Rocks, where there are excellent views of Filey sea front. If it’s low tide you can walk to the end of the Brigg on the walkway. Note that the end of the Brigg disappears two hours either side of high tide, so check the Tide Times. Don’t be tempted to go down the path at the end of the Brigg. This is closed off as the descent here is very worn and dangerous. Only use the path described to descend to sea level. 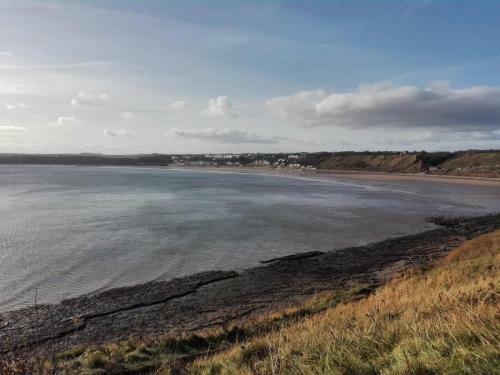 If you are not walking the return to Cayton Bay, the bus station in the centre of Filey can be reached via the beach and cobble landing. Alternatively, return back to the stone monument you passed earlier at the top of the cliff. From there walk towards St Oswald’s church and cross the bridge over the Ravine Road. The town centre is then a short walk away. 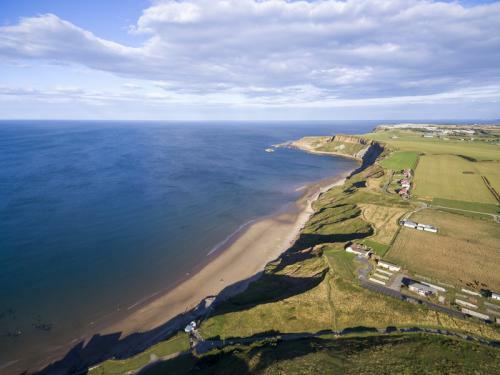 Arial view of Cayton Bay. 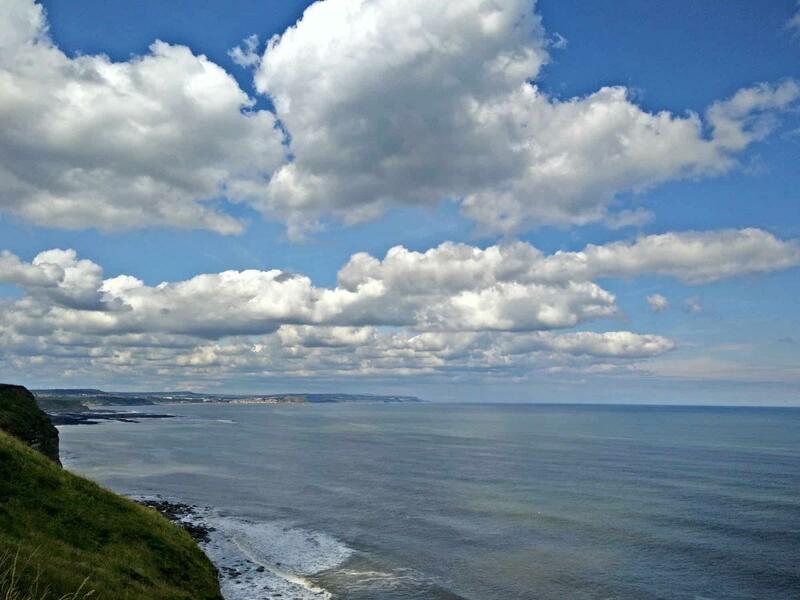 View from top of North Cliff, looking North towards Cunstone Nab and distant Scarborough.